When 32-year-old Zyiad first fled his war-torn homeland of Yemen and arrived on South Korea’s southern Jeju Island as a refugee, life didn’t look so bad. Once an heir to a successful family business in Sana’a, Yemen’s capital, Zyiad was forced to flee his home and leave his business behind. 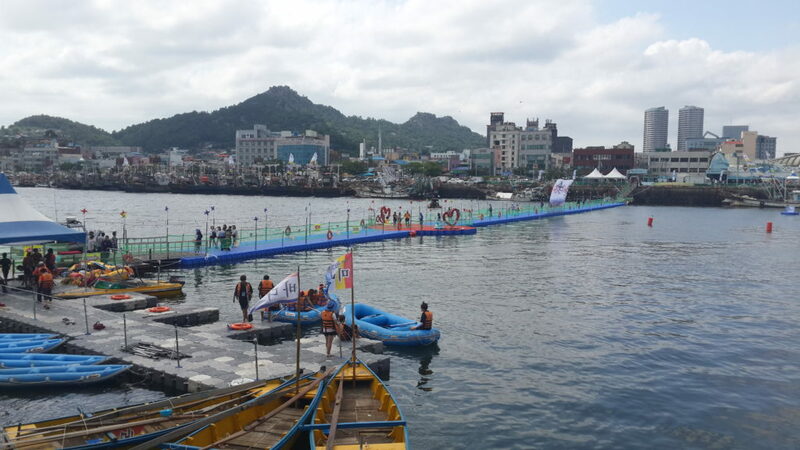 Arriving in Jeju Island with some 480 other Yemeni refugees, Zyiad says his new hosts welcomed him with curiosity, until a social media campaign turned public opinion, and Zyiad’s island hosts, against him and his fellow refugees. Now Zyiad takes up daunting menial jobs in Mokpo, a small South Korean port city, where cold treatment from his new hosts has pushed him and his fellow Yemeni refugees to feel like the “underclass of the world.” Attitudes in the country quickly shifted against the Yemeni refugees living temporarily in Jeju, as xenophobic fears gripped the homogenous nation. South Korea’s population is currently composed of around 96% ethnic Koreans, with often conservative attitudes towards foreigners. Protesters came out against the refugees, with some accusing the Yemenis of rigging South Korea’s lenient visa policy. Out of hope and out of money, Zyiad first left his hometown Sana’a when the Saudi-led war broke out in 2015 after the Houthi rebel movement, which champions the country’s Zaidi Shia minority, took control of large areas in Yemen. “It is hard, very hard to feel like you and your people have become the underclass of this world,” he told NOVAsia. “I was once a very successful man. I had my own computer shop and my business was very successful. My family owns a chain of stationary stores in Yemen as well. In fact, my family members were some of the very first pioneers in the country. They started the first paper factory in Yemen decades ago. “We have always done business and our life was fine until the war was forced on us. Today Zyiad’s life is very different, working day and night as a shipyard painter just to survive. 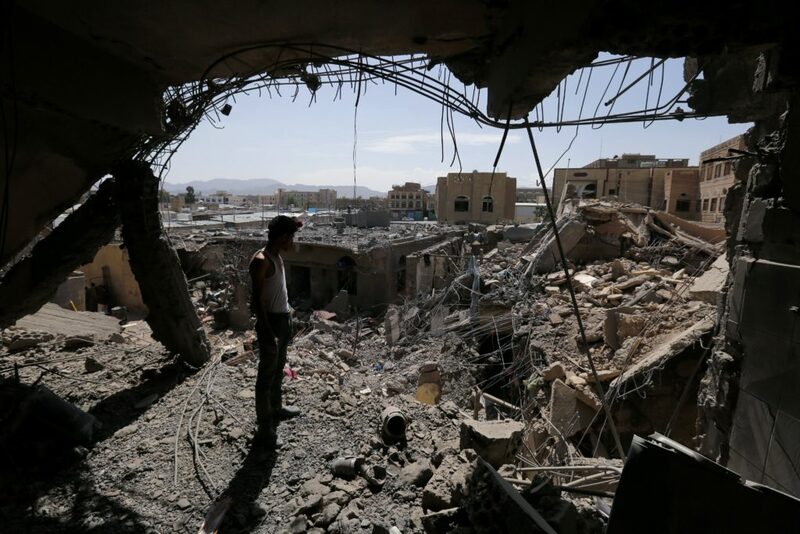 Over four years have passed since Riyadh began its air raids to support the government of President Abdrabbuh Mansour Hadi who was forced to flee when Houthi fighters started taking over. The movement took advantage of the fragile presidency of Hadi who assumed power following an Arab Spring uprising that started in 2010 and left not only Yemen in turmoil, caused ripple effects across the entire Middle East. According to sources, up to 68,000 people have been killed in the war and it has been estimated that 37 children have been killed or injured on average every month over the past year in bombings from air raids. Deaths have also been attributed to landmines, snipers, improvised explosive devices and starvation. What was planned as a short-term intervention by Saudi Arabia turned into an endless nightmare that continue to this day, transforming the country into a new proxy battleground in the Iran-Saudi Cold War. Saudi Arabia accuses Iran of financing and arming Houthis but Iran denies the allegations and motions of settlements remain in vain. An economic meltdown created by the crisis following a trade blockade and the holding back of civil servant salaries in northern parts controlled by Houthis has caused millions to starve. It is estimated that around 80,000 children have died between 2015 and 2018 because of malnourishment in what the United Nations has described as the worst man-made humanitarian disaster. 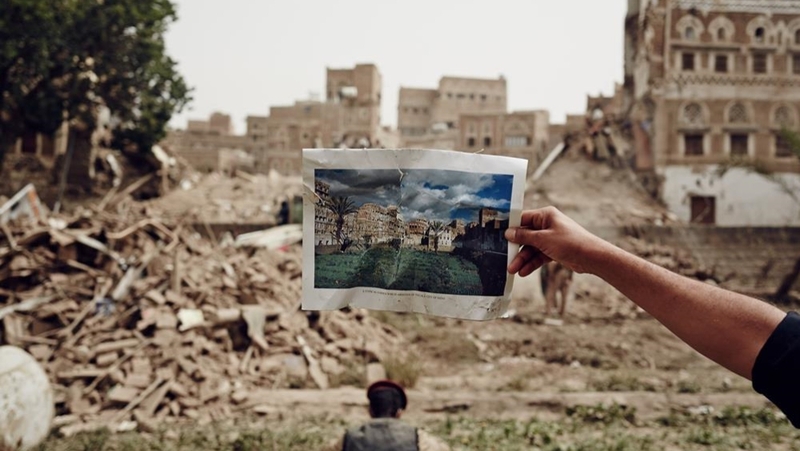 A resident compares their home in Yemen before and after the destruction. Escaping the horrors of war, Zyiad first left to Saudi Arabia where he stayed for six months at a relative’s house. He, however, decided to leave the region all together feeling offended by states’ consortium with Saudi Arabia at the expense of his people, bargaining their lives between political gains and religious slogans. 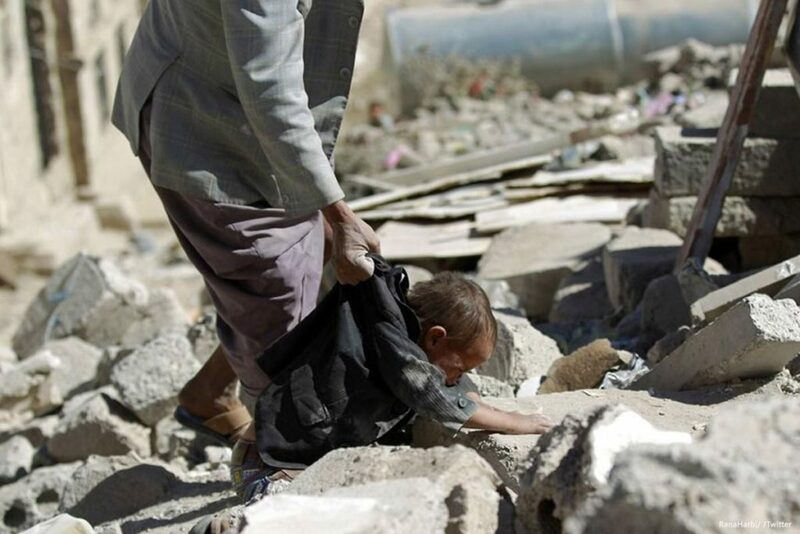 US alliance with Saudi Arabia and its technical support of aircraft fuel and weapons was another reason for him to feel that his Yemen will find no way out of destruction. “At first, Saudi Arabia was the easiest way to leave. But a sense of humiliation always haunted me for I’m living in the country that is somehow the reason behind the suffering of my people,” Zyiad said. Zyiad moved to Malaysia and stayed there for three years before getting into South Korea through Jeju. “I used to do some illegal work like being an assistant for Arab students studying in Malaysia or help Arab tourists there,” he said. 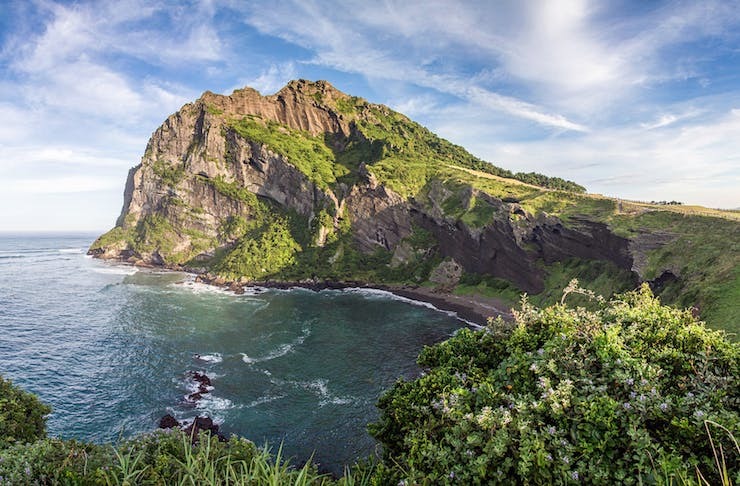 South Korea’s jeju Island, where Yemeni refugees first came using the islands no-visa entry policy. After the controversy over Yemeni refugees, Yemen was struck from the list of countries where citizens can travel to Jeju without a visa. Zyiad said his life is far more stable in South Korea despite feeling not welcomed. The irony of the anti-refugee sentiment in South Korea stems from the fact that it was once the site of one of the greatest humanitarian disasters in the 1950s. One would expect that the dominant sentiment of a nation that saw many fleeing their land during the Korean War, would be empathy towards the fragile. Yemenis in South Korea became a major global topic, not because it deserved attention, but because the hysterical reaction by the public was difficult for the world to get its head around. In 2016, for example, Germany handled around 722,000 asylum seekers following a surge of arrivals from the Middle East that began a year earlier. At the time of the crisis German Chancellor Angela Merkel uttered her famous mantra “we can do this” delivering a brave and bold message about Germany. Sweden also received the most asylum seekers per capita globally in 2015, which saw a record-breaking 162,877 of them entering the country. 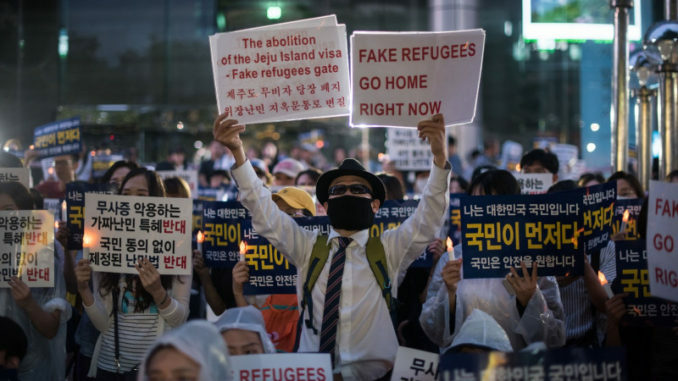 However, with just a few hundreds of asylum seekers to handle, South Korea may have delivered an opposite message to the world; anti-immigrant activists went out rallying describing describing Yemenis as potential terrorists, rapists or illegal immigrants stealing jobs. 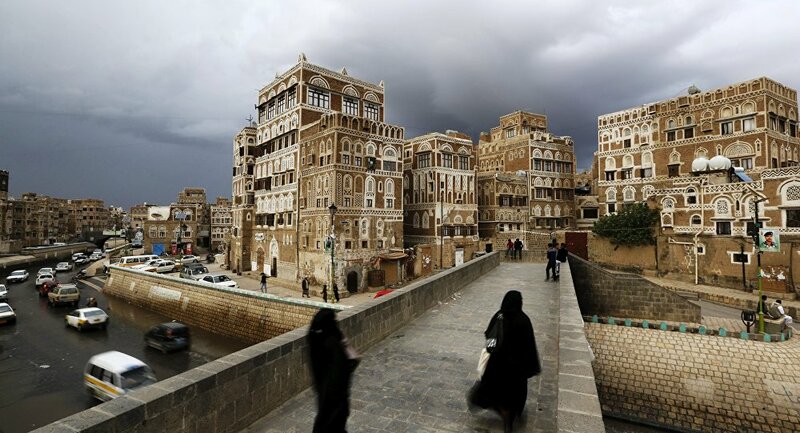 Of the total Yemeni asylum seekers, only two were granted refugee status, while 412 were allowed to remain in South Korea on humanitarian visas on the condition that they would leave once the situation stabilizes in Yemen. A total of 56 Yemenis were denied humanitarian visas, while 14 others have withdrawn their refugee applications or voluntarily left South Korea. The country has been called on to accept more displaced people from around the world, with only 840 out of 40,400 people granted refugee status since 1994, the majority being applicants who fled North Korea. 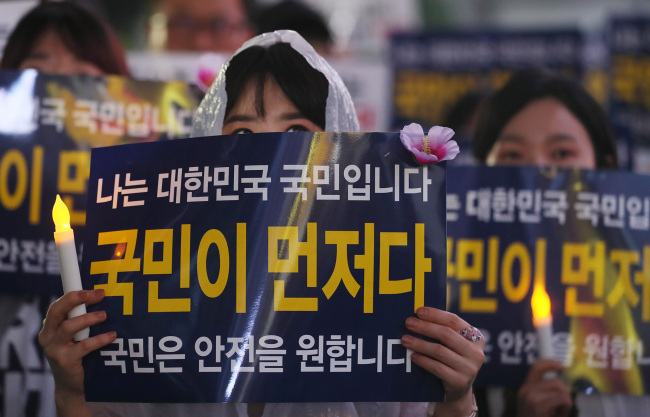 Protestors in Seoul come out against granting refugee status to the Yemeni’s on Jeju Island. Grasping his opportunities, Zyiad says he works for over 13 hours a day as a shipyard painter to sustain a living, and despite the physical struggle, he believes staying in Korea will pave the way for a better future. “Anyone wants to be where their family is. But the war has been forced on us and I can’t be there anymore,” he said. “I have a feeling that I may have a better future in South Korea. Zyiad’s family are Ismailis, a form of Shia’a Islam that represents a minority that has always been a subject of prejudice, marginalization and accusations of polytheism, and continue to fall victim to the polarized war, as in the case for most of the country’s minorities. Zyiad said he was on the brink of exiting religion entirely. “My ancestors were renowned traders in Ethiopia and in the 70s my family decided that all we have must go to the benefit of our country Yemen and so we moved,” he explained. “We always wanted to do business. We never aimed to be fettered to a chair in an office and do some regular governmental work that does not bring in any money to the national economy. “However, when I think of all the prejudice we were subjected to, the marginalization and hate just we are Ismailis, I sort of hate everything related to the people and even religion. “I love god, but god to me is anything but what is practiced by those “hate-everything” sects. “The way religion has been used for political gains has made me hate religion. Zyiad also expressed his frustration about the entire Saudi-Iran Cold War, in which people like him suffer the most. “If Saudi is worried of an Iran-backed Shia expansion in the region, why did it not do anything that shows it actually cared about the already-poor country before any war was to occur. “Yemen was never a concern for Gulf states or Iran. How come they care now if the people of Yemen are ruled by Shias or Sunnis. “People are dying. They don’t have food or medicine. “The money that Saudi Arabia had spent over the last four years could have been used to stop the crisis in some way or another. “Wars never had winners, even if there was a stronger side. Zyiad also expressed his hope that South Korea would broker talks to ease tensions in Yemen. “I pledge the Korean government to take the initiative of starting diplomatic talks to stop the crisis,” he said. Shahlaa is a Masters student at the Yonsei Graduate School of International Studies. Her home country is Bahrain which she believes is a piece of heaven and backs every historical evidence supporting it was once the home of Utnapishtim. 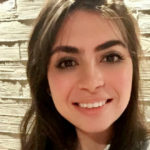 She believes she met the extraordinary, the interesting and the insane during her three years of journalism work at the Bahrain-based Gulf Daily News. She studied mass communication and has interest in the Middle East’s conflicts.